Item #GSE-414: Aproximately 38-39mm Sodalite Sphere of approximately 68 grams. Item #GSE-183: Approximately 76.2mm Sodalite Sphere; cobalt Blue with Black, White and Gray veining. 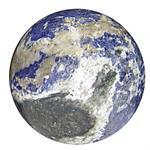 Item #GSE-184: Approximately 70mm Sodalite Sphere; cobalt Blue with Black, White and Gray veining.